Nothing earth shattering here! A blend of oils that hint at the goodness of Mother Earth. Lavender powder adds more earthy delights! 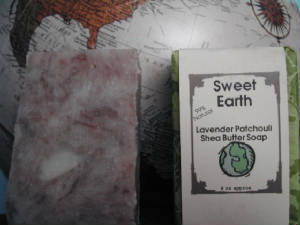 This soap is mainly lavender, but the patchouli grounds the scent blend while the vanilla sweetens it. It is a complex lavender as compared to our best selling "Hidden Meadow"--100% Natural Lavender Oatmeal Facial Soap. The hemp oil adds extra moisture (and just seems fit a Patchouli scent!!) and the ground lavender colors it to a light brown and provides light exfoliation.